Bromsgrove is a small town in Worcestershire. 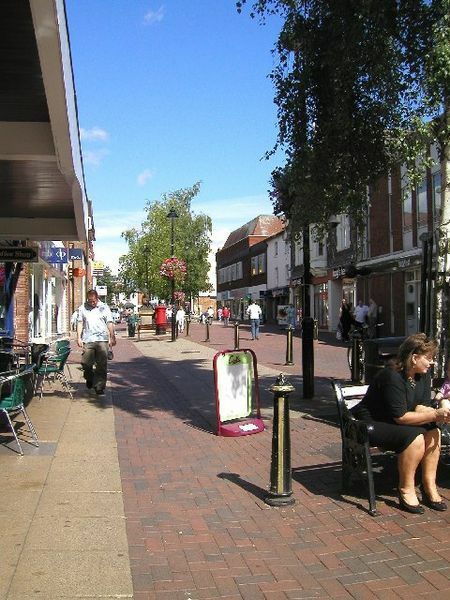 It is home to many different and diverse shops including a wide variety of fast food outlets, clothing shops, charity stores and hair dressing. However today we're focusing on the beauty aspects of Bromsgrove and the comparison between quality and price. The first shop that we looked at was Body Care which specialises on beauty products and offers an extensive range of different goods. We tried out and bought a large number of their products as they are cheap, affordable and good quality. Here are some items we purchased. The nail varnish is available for just £2.99 and it is a great quality. Definitely worth buying. It suits my skin tone wonderfully and Barry M lasts for such a long time that you get so much for your money. Although slightly out of our price range, at a whopping £15.00, the Katy Price perfume smelt lovely and fruity. A must have item for the upcoming summer. A few other purchased items were some hairbrushes as I was in need of a new one. These are designed for any type of hair and keep it in a better condition. All together this came to around £25.99 but I think it's worth it as you're getting good quality. After having a fun time in body care I took a peek into Boots for a look at some of the products. I wanted to buy all the shades of lipgloss as I loved the texture and colour and I think my family would borrow them too. I particularly like the purple one however they each amounted to £22.00, meaning it would cost £176 for the set. A little more expensive than I am looking for. This lipstick is by smashbox and is £15.00. 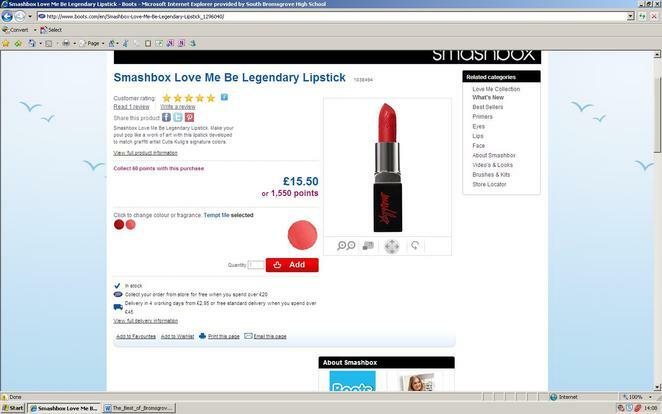 We loved these lipsticks, but once again they were slightly out of our price range. Overall, although Boots products were mainly similar (apart from a few high price items) to the stock in Body Care, Boots was a lot more expensive. We made a comparison between cotton wool in both boots and body care and discovered the Boots cotton wool was almost £1.00 more expensive than in Body Care yet they were the same brand. To conclude, if you were looking for higher price, quality and well-known brands then Boots is suitable for you. However if you're looking for budget items which you can get for the cheapest price possible Body Care would cater to your needs.